Diamonds spark a fascination and curiosity worldwide whether you're in the market for one or not. It seems like there is always so much to learn about the stone, as the diamond industry proves to be ever-changing. Well, we can tell you one thing that has remained consistent over time—diamonds are expensive. The high price points are just another contributing factor to the wonder of the diamond, and today, we get to hear a tidbit of insider knowledge from Michelle Adorjan Chila, SVP of marketing and publicity at Tacori, on the pricing of diamonds at different carat sizes. "At Tacori, our engagement rings are sold as 'semi-mounts', meaning without the center diamond. What we love about semi-mounts is that it provides flexibility in terms of choosing the preferred carat weight or the cut of the gemstone; in other words, it enables you to design your dream engagement ring. And because each Tacori ring is handcrafted in California, each ring is made-to-order and unique for the individual couple. "Essentially, here at Tacori, you need to pick the size and shape of your center diamond (and your budget, of course)—and then we'll build your dream ring around the diamond you choose. Alternatively, you pick your dream ring from Tacori, and we'll make it to fit virtually any diamond size or shape in the world. 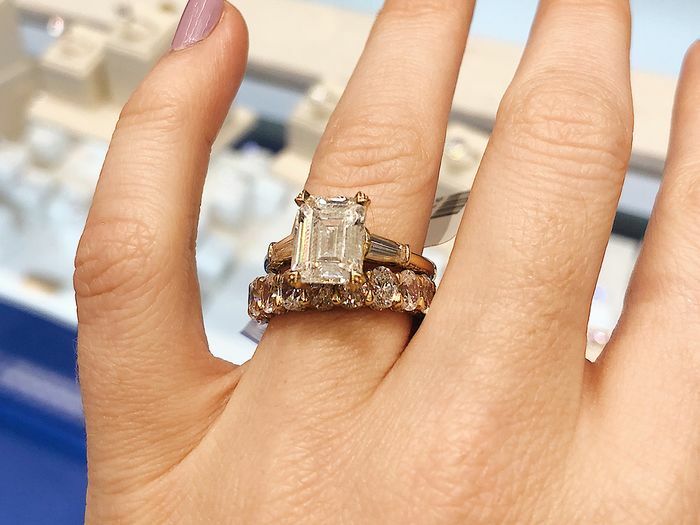 This personalization is especially great when you have a 'legacy' or 'heirloom' diamond that is being handed down through the generations and you simply want to change the look and feel of the setting to make it uniquely yours." "Here's how size matters with a pear (compare the 1.5-carat diamond versus a three-carat center diamond in the styles below)." "This is a 1.5 carat pear diamond with a very good cut, G color, and VS2 quality." "This is a three-carat pear diamond with good cut, F color, and VS1 quality." "And here's how it matters with a round (compare the one carat versus a 2.5-carat center diamond in the styles below)." "This is a one-carat diamond with very good cut, G color, and VS2 quality." "This is a 2.5-carat diamond with ideal cut, G color, and VS2 quality." Carat Weight: Within .05 +/- the round carat. For example, the carat weight range was .95 to 1.05 for one carat, 1.95 to 2.05 for a two carat, etc. Next up, find out how to save money while shopping everyone's favorite fast-fashion brand, Zara, according to 123 of its employees.